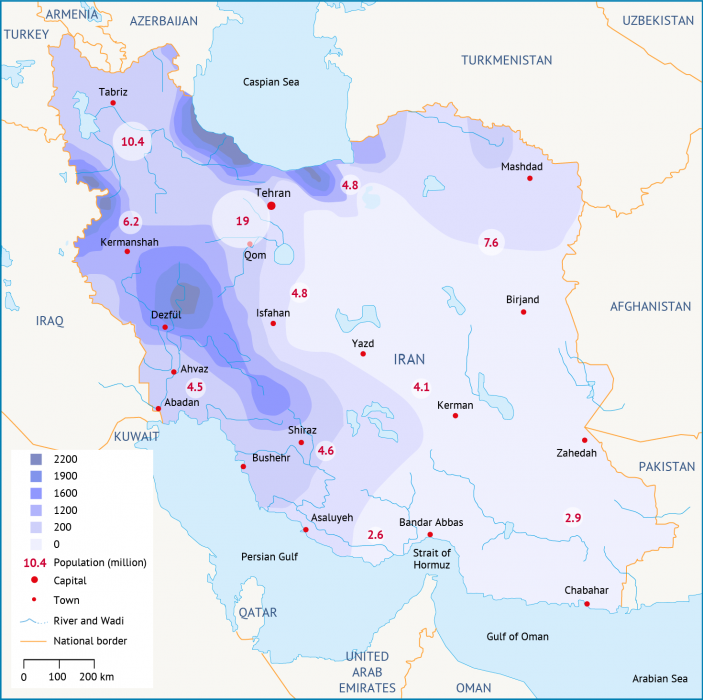 Iran is located in the world’s dry belt, with annual precipitation of 250mm or a third of the global average. In the past decade, the actual precipitation has been even less than this meagre average. The distribution of the precipitation is uneven across the country. The least precipitation falls in the most densely populated areas (Map 1). In the last 50 years, Iran has faced ten severe and prolonged droughts, the latest in 2001-2004, which have significantly threatened water availability in all sectors. It is expected that climate change will further increase the risk of droughts in some parts of the country and cause floods in others. Map 1. Precipitation distribution (in mm) across Iran’s 31 provinces. Numbers indicate selected populations in millions of people, (Source: Niloofar Sadeghi ). Since the 1980s and the introduction of the government’s policy to become self-sufficient in wheat production, significant state investments have gone towards damming major rivers and expanding the area of cultivated land. As a result, many large-scale irrigated-farming schemes have been developed and dams built over major river systems. In 2004, Iran announced that for the first time since the Islamic revolution of 1979, it had become self-sufficient in wheat production. Although this policy brought greater political stability, it had an irreversible impact on the sustainability of the country’s renewable water resources that persist to this day. The most important consequence of this policy was overexploitation of both surface and groundwater resources to increase the land under cultivation. Often the water was diverted from rivers without taking into consideration the minimum environmental need. This diverted water was offered at a low price to farmers in return for a small portion of the sales of their agriculture products. The government provided subsided fertilizers and pesticides to improve crop yields, causing widespread soil and water pollution. Moreover, during the three decades from 1980 to 2010, the number of licenses issued for digging wells increased immensely, resulting in overexploitation of groundwater resources for agricultural purposes and making agriculture highly dependent on groundwater. To date, farmers continue to dig illegal wells, which account for 40% of all the wells in the country. Iran’s greatest water challenge is low efficiency by the biggest consumer, agriculture. Agriculture accounts for only 10% of GDP but consumes over 92% of the country’s water. The cropping pattern is mostly composed of crops with high water consumption rates, and the most common irrigation method is canal irrigation, which has high evaporation and high seepage losses. The use of chemicals (fertilizers and pesticides) is polluting both the soil and water, making it difficult to reuse agriculture wastewater in other sectors and posing environmental and health threats. The low agricultural water fee is contributing to careless use of water by farmers and high water losses. The agricultural sector is responsible for 19.2% of Iranian jobs, which highlights the complexity of implementing any short-term plan to cut water allocation to this sector. The case of Lake Urmia exemplifies all these challenges. Over-damming of feeding rivers to the lake, diversion of the lake’s water to agriculture, low irrigation efficiencies and high dependency of farmers living off agriculture coupled with recent droughts have all contributed to severe shrinkage of the lake to less than half its size in the 1970s. This abnormal shrinkage has significantly affected the regional economy, its air quality, agriculture and, more importantly, the quality of people’s lives. 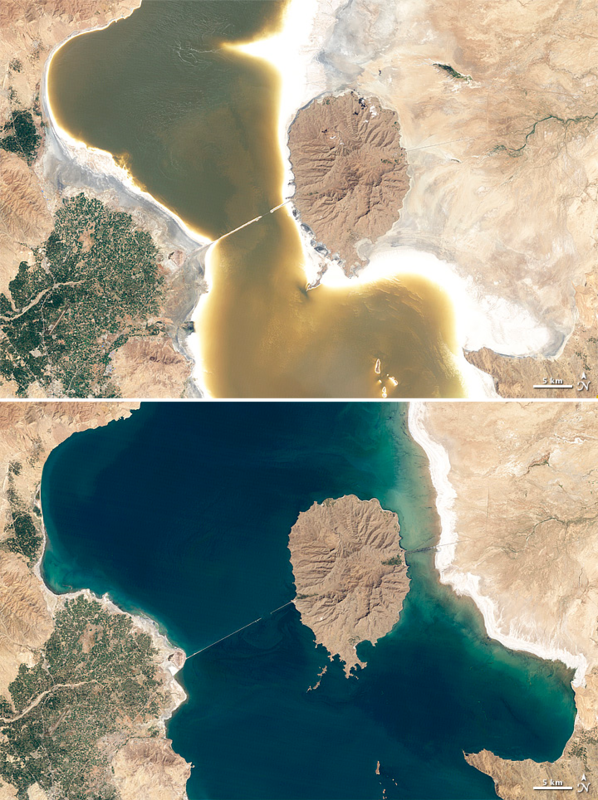 Photo 1: Images of Lake Urmia on August 13, 2011 (top), and August 25, 1998 (bottom), (Source: NASA's Earth Observatory, Flicker). Groundwater levels are dropping at an average of 2-4 metres per year, since the slow-filling aquifers have not been able to keep up with the growing number of water users and subscribers. This drop has caused unprecedented land subsidence of an average of 2-30cm in different plains across the country and sinkhole formation. All of these factors are contributing to massive desertification. To restore this tremendous loss in the renewable capacity of aquifers, a holistic demand management scheme should be implemented to lower consumption by 11-12BCM per year. Most of the overexploitation occurs in the central basins where less surface water is available. Given the sustainability of the ancient qanats system to extract groundwater, the potential importance of qanats in helping to solve Iran’s water security challenges is unquestionable. Qanats convey water underground, which reduces evaporation, and only depend on natural gravity, rather than external sources of energy, for water transmission. Pesticides and fertilizers are subsidized by the government and are therefore used extensively in agriculture. Irrigation water washes these chemicals into groundwater aquifers and agricultural run-off. Agricultural wastewaters are thus highly contaminated with chemicals that regularly contain heavy metals. Moreover, traces of nitrates are found in many urban sewage systems as well as in industrial effluents. This pollution makes water reuse controversial, introducing as it does potential threats to the environment and human health. With the collapse of Iran’s traditional and more sustainable water management system, many local communities have lost the sense of ownership and responsibility towards conservation and management of water resources they once had. This is evidenced by the careless use of water by farmers and the low water-use efficiency in the agricultural sector. However, the situation in most of the large cities, including Tehran, Isfahan and Mashhad, is different. Here, the general awareness level is high and the public demonstrates a willingness to engage in improving water-use efficiency. The first step in any successful water management plan is to have reliable and precise water data. In Iran, groundwater-related data (wells and springs) are collected every five years through field visits and data series analysis. The water levels in rivers are monitored on a daily basis and measured twice per month. However, the monitoring equipment (including installed gauges and counters) is not sufficient and data from other sources, such as satellite images, are as a result of sanctions not available as a means to compare and verify ground data. In this regard, the data provided by various government offices often differ significantly, which inhibits a united response to water resources by the concerned authorities. In pursuit of water security, the government is currently considering alternative solutions to the rising water demand. One of the alternatives that is often referred to by government authorities is inter-basin water transfer, whereby water is imported from river basins outside the country, e.g. Tajikistan, or desalinated seawater is transferred from the Persian Gulf or the Caspian Sea. Although these schemes may provide a temporary remedy, in the long term they will add to the social and environmental complications. At the same time, such rushed solutions do not address the inefficient use of water. By improving water-use efficiency, particularly in agriculture, the water saved can be largely used in place of the transferred water introduced by these solutions. The government has attached high importance to demand management. Nationwide programs are being implemented to raise public awareness about the growing water scarcity and to engage the public in water-saving measures. These programs include capacity building through mass media (state TV and radio), training initiatives in schools, installing public boards in cities and metro lines in cooperation with municipalities, developing mobile applications, frequent interviews with water officials and educating journalists on the new concept of water journalism. Economic incentives, such as low-interest loans, are being provided to farmers to install modern irrigation systems, like drip irrigation or sprinkle irrigation, which have better water-use efficiency. New agricultural practices, such as hydroponics, are also being used for large-scale greenhouse production in some cities, including Tehran, Hashtgerd, Karaj and Kish Island that consume much less water. In recent years, with the help of different UN agencies, sustainable agricultural practices have been introduced in various river basins, including the Lake Urmia basin, which have improved water use. Small-scale initiatives are being implemented in some areas, with the aim of matching cropping patterns with available water. However, one of the biggest challenges that remains unsolved is the lack of proper groundwater monitoring, especially insufficient counters to monitor extractions from illegal wells for agricultural use. To reduce water demand in urban areas, a more consolidated effort is required to repair leakage and seepage along conveyance lines, standardize water taps, separate drinking water from non-drinking water uses, and collect run-off using urban water harvesting techniques. During the drought of 2001-2004, the government adopted a new pricing model that incorporated a consumption ceiling. Any consumption above this ceiling resulted in escalating fees per volume of additional consumption. This model is still in place. During the same drought period, rationing of drinking water and restricted supply were introduced in all major cities, including the capital Tehran. Iran Times. Available at www.iran-times.com/islamic-republic-is-again-self-sufficient-in-wheat/. BK, 2015. ‘One well per every 104 Iranians’, Deutsche Welle, Farsi service. Statistical Centre of Iran, 2015.